Chris is a former soldier from Derbyshire who was injured twice on two separate tours of Afghanistan. He was just 18 years old when he was first deployed with 2nd Battalion The Mercian Regiment in 2007. A bullet shattered Chris’s leg in a battle that claimed the lives of two comrades and injured 16 other soldiers. After being evacuated back to the UK and undergoing rehabilitation at Headley Court, he was deemed fit for active service so went on a second tour in 2009. Chris’s second injury occurred when fragments of a grenade entered his head through a gap between his helmet and glasses. Chris was fully conscious during the aftermath and recalls’ I remember blood dripping down my face and all I could think was not again.’ Back in the UK doctors told Chris that he needed a high risk operation that he might not survive. Chris says ‘I told my parents that if the op goes wrong then I don’t want to live, I don’t want to be a vegetable’. Fortunately the operation was a success but one lasting effect of the injury was Chris’s diagnosis with epilepsy. As a result he was medically discharged from the Army in 2011. Prior to leaving the Army, Chris went on a course to help identify job options in civilian life. He visited a home where disabled residents were undertaking gardening; he spent a few days helping them out and decided that this was a career path he’d like to pursue. ‘I enjoy being outdoors so didn’t want a desk job. Even though disabled, the guys were doing hard landscaping which I thought was amazing.’ Chris therefore applied to do a two year college course in Horticulture. His studies were enabled by a charitable grant which covered essential costs including clothing, safety equipment and travel. The course gave Chris practical experience in the many different aspects of landscape gardening. Despite missing the camaraderie of the Army, Chris told us, “It was a good course and The Soldiers’ Charity helped me out massively through this funding, they sorted out everything from the kit to the bus fare. Now I’ve finished the course I hope to get a job so I can carry on doing something that I’ve started to love’. 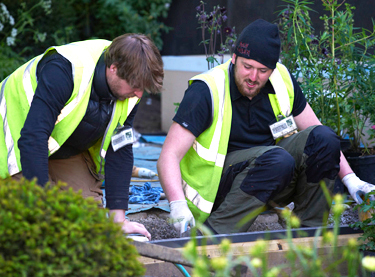 Chris was an integral part of the landscaping team who built our charity garden ‘No Man’s Land’ at the 2014 Chelsea Flower Show. Prior to the build he worked closely with the nurseries, our designer Charlotte, and the horticultural therapist at Headley Court to learn about the plants that are used on the garden and see how fellow soldiers, currently going through rehabilitation, are benefiting from the charity funded horticultural therapist. This has been invaluable to Chris as the new skills he has learned will provide a vital boost to his CV. Chris says his Chelsea experience has served as an emotional lesson about the challenges and hardships faced by soldiers then, and the importance of having a charity dedicated to the welfare of soldiers today. ‘When you leave the Army, you have to adjust to a whole new way of life. In a way, it’s kind of like a no man’s land as I know I felt a bit lost and quite alone. But I soon found my way, thanks to the support of my family and The Soldiers’ Charity’. Without your continued generosity we wouldn't be able to be there for former soldiers like Chris when they suffer injury or hardship. Help us continue our work in supporting soldiers, veterans and their families by making a donation today.